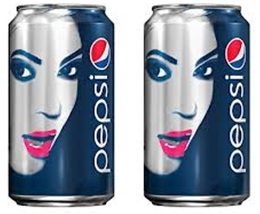 Now is the day to remember, for this is the time when people will be seeing Beyonce’s face printed on Pepsi cans. Beyonce in can…that’s what I thought of when I saw pictures of her face marked on cans, showing her support in the company’s “Live for Now” campaign. This is a smart move, making it appear like a limited edition cans that all Pepsi and music lovers can have. As the product’s brand ambassador, she was able to snag a deal which worth’s about $50 million dollars! All I can say is…whoaw!! Today, I think Pepsi will be able to come up with a mentality, in which their product will be always associated with Beyonce or the other way around; it will be a breeze for them to achieve this, since she’s not just a Pop star but a businesswoman too, so I think she can really contribute a lot on how to promote the product and reach thier target market. On one of Beyonce’s interview, she said “Pepsi embraces creativity and understands that artists evolve…As a businesswoman, this allows me to work with a lifestyle brand with no compromise and without sacrificing my creativity.” True enough, I guess it will be a win-win case for both parties…and I mean it will be good for Jay-Z too (*wink*wink*). 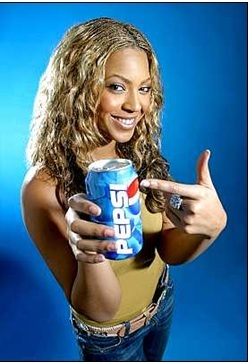 Beyonce started to endorse Pepsi way back 2002, but only this time she got it big as the face of the company.